Time Anytime to Anytime (Datetime (any formats), Unixtime, ChromeTime, LDAPTime, Filetime, SystemTime, Mac Absolute time, Mac HFS+ time), Time difference, Add time, Substract time. See documentation for more details. XL-Tools can be installed using the installer or used as a standalone application. In order to start using it, just run the executable file from the start menu or the directory you install it. 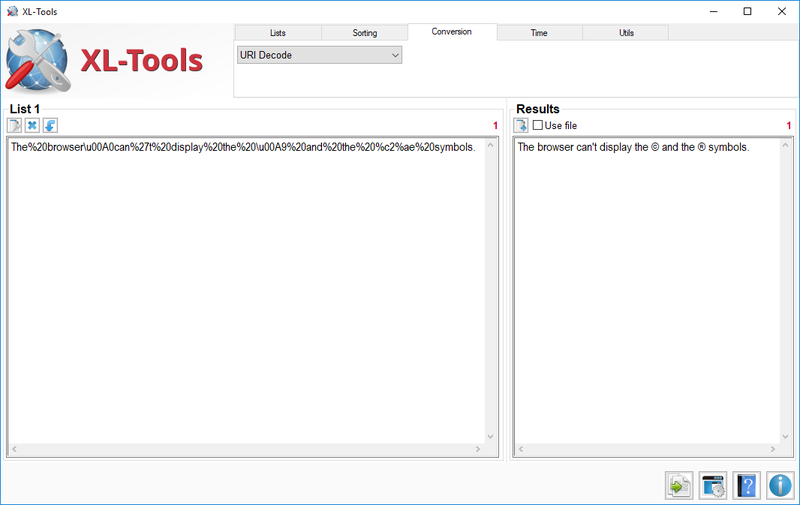 New: [Conversion] Added SHA1 - Base16 to Base32 function. 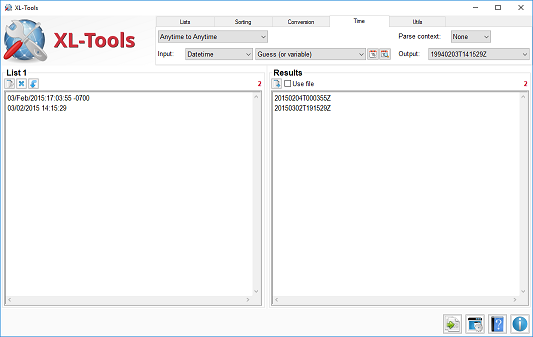 Fixed: [Datetime object] There was a problem with the pattern combobox in the Datetime object window. New: [Datetime database] New pattern %P (am/pm lowercase) in Database when creating a new Datetime object. Fixed: [Datetime database] Regex was not including upper cases when creating a new Datetime object with %p pattern (AM/PM uppercase). Fixed: [Utils] When "IP Range to CIDR" was resolving to more than one range, the function was returning the number of range instead of the ranges. Fixed: GeoIP2 was generating fatal error when trying to resolve some IP addresses like non public addresses. 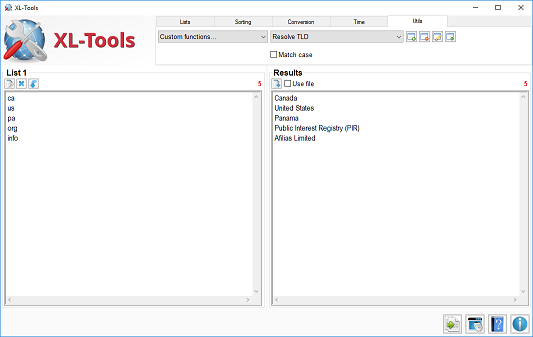 New: GeoIP is replaced by GeoIP2 (support for IPv6). 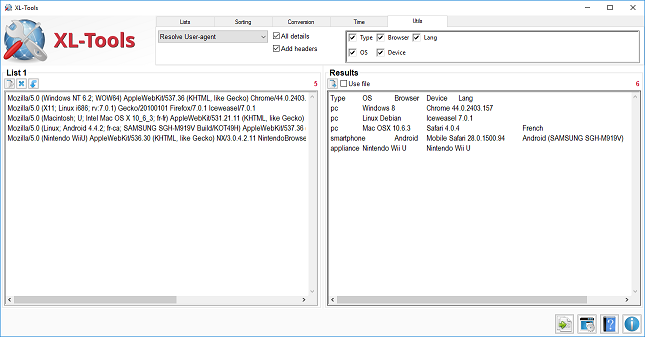 New: Interface for Resolve GeoIP and Resolve User-agent are modified. 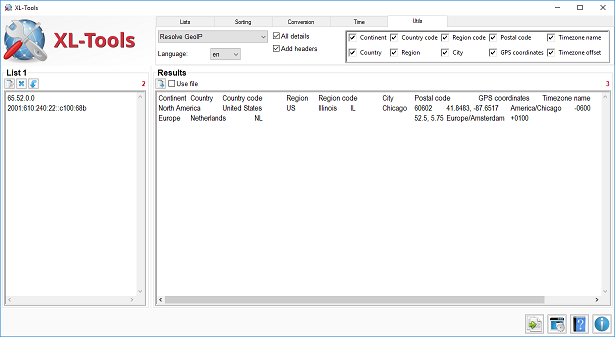 New: Some options (Local timezone, Default language, Charset) are moved from Datetime database window to Settings window. New: You can now change the font for the lists. New: Open user directory from Settings window. 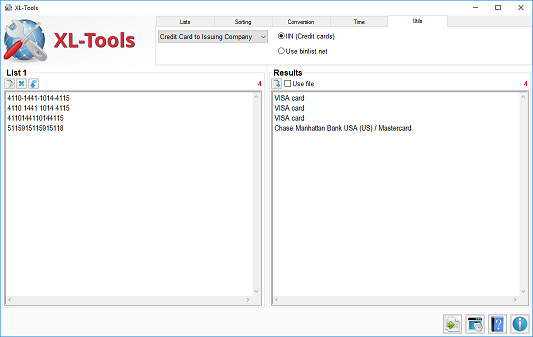 Fixed: Credit Card to Issuing Company with Binlist.net was not working. Fixed: When copying results from list 3 to list 1, items were not counted. Fixed: There was an error in the autoconfiguration of the tool. 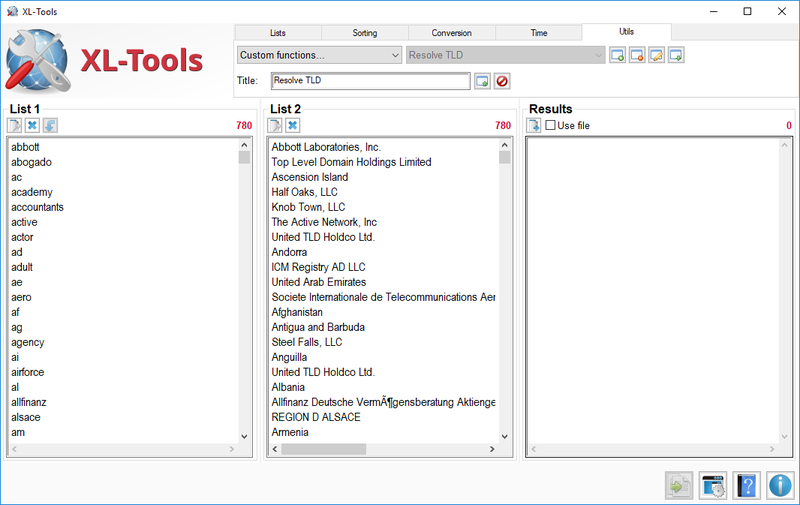 New: Best integration with the new XL-Parser tool. New: [Time] New Mac Absolute time to Anytime function. New: [Time] New Mac HFS+ time to Anytime function. 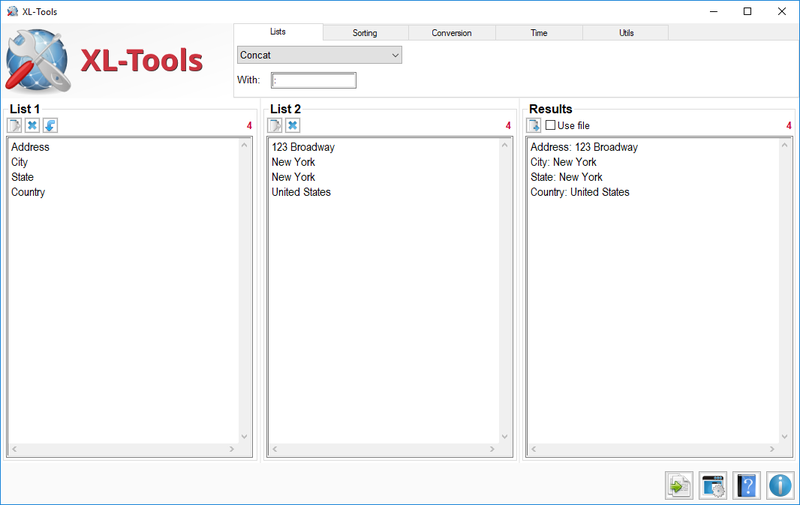 New: [Utils] With Resolve IPv4 GeoIP and Resolve User-agent functions, it's now possible to select multiple options. Fixed: Donwloading and converting MAC OUI database is now faster. Fixed: Adding or modifying Custom functions is now faster. New: [Time] With time difference, you can now get result by absolute number of years, months, weeks, days, hours, minutes or seconds. New: [Utils] New Address to GPS coordinates function. 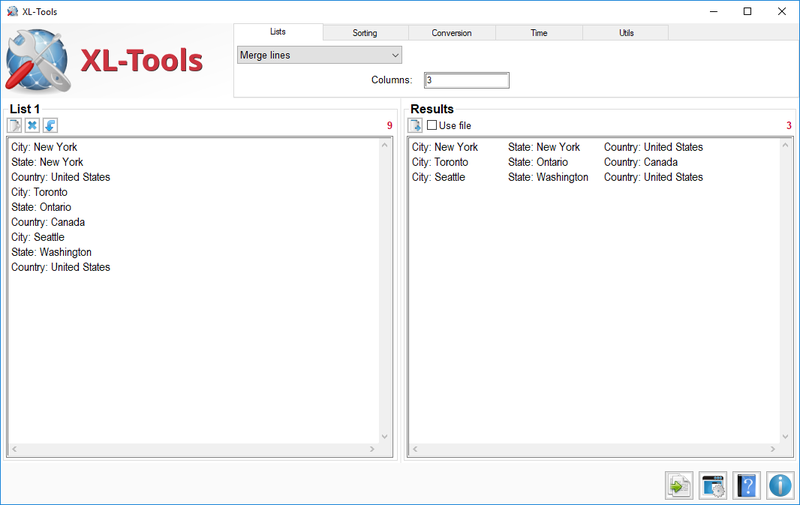 New: [Utils] New Distance between locations function. 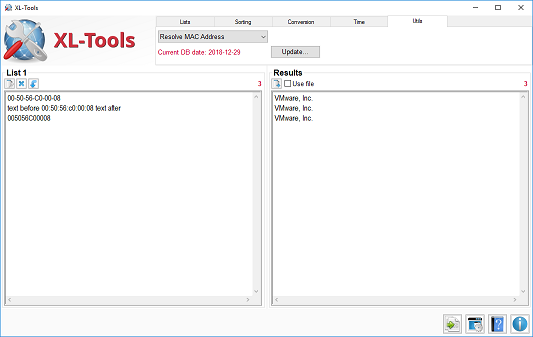 New: [Utils] When Resolve MAC Address function is selected, the current date of the database is displayed. Fixed: When XL-Tools is used for the first time, some defaults values are set to prevent error with [Datetime]. It includes language (en-US), local timezone (America/New York) and charset (cp1252). You may change these values before using [Datetime] function. New: [Datetime] Output language is now known as Default language and applies to input as well. 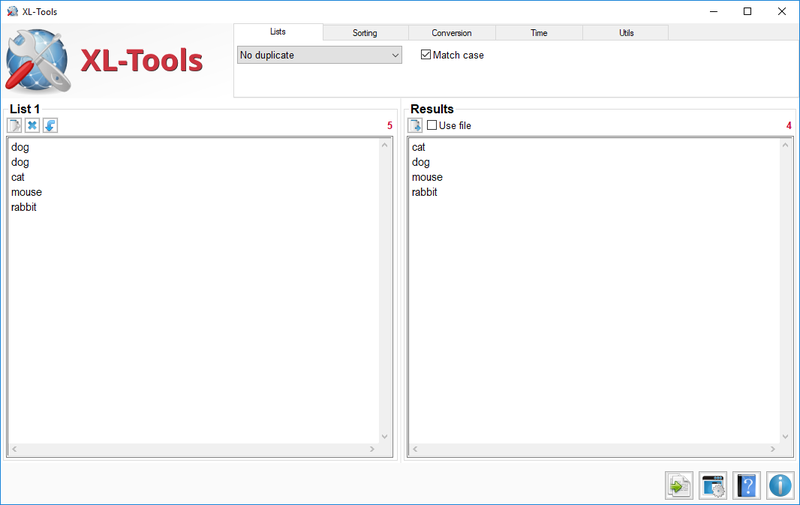 If a datetime contains language specific object, like month name, you can set the appropriate default language and XL-Tools will be able to parse it correctly. New: [Datetime] Double clic on an entry in the Datetime format will open it in the Edit window. Fixed: [Datetime] There was a problem when timezone was implicetly included with datetime format like unixtime. Fixed: [Datetime] There was a problem with ambiguous timezone abbreviation like EST, PST, CST, etc. These ambiguous timezones are now set to fit the most appropriate offset. See Documentation. Fixed: With [Lists] Merge Lines, there was a problem when evaluating required parameters. Fixed: When creating a new datetime format, there was a bug with the timezone pattern in combobox (%Z-%z). Fixed: When a list contained more than one empty line at the beginning, items were not enumerated at all. Added: In List1, a new button to copy data from results. 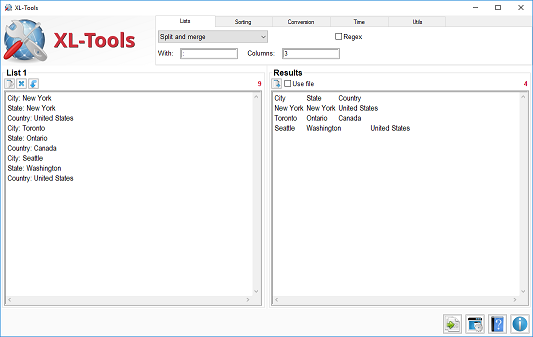 Added: In Results, a Use file option force to use a file as output. Added: In [Sorting], a new Randomize function to shuffle a list of items. Fixed: In custom function, there was a problem when the title of a custom function contained some special characters like parenthesis. Input and output formats can now be fully customized. Datetime formats are stored in a database: You can add, edit or delete any formats from the database. You can set a format to be use as input, output, both or not used (hidden from list of choices). Local timezone can be customized. Output language and charset can also be customized. Time functions can be used on any string. Data before or after the datetime object can be parsed with the results. Oldest functions like Unixtime to Anytime, ChromeTime to Anytime, LDAPTime to Anytime, Anytime to Unixtime and Date to Weekday are now available using the appropriate datetime formats. 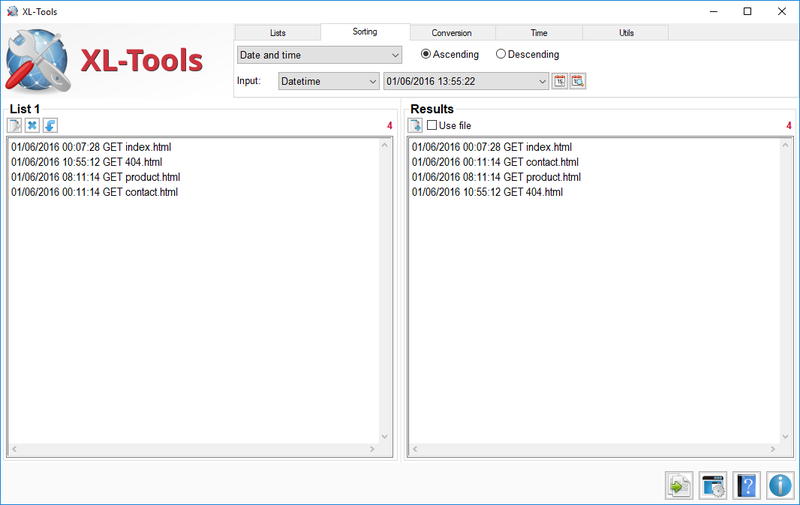 Two new time functions have been added for Windows Filetime (64 bits hexadecimal) and Windows SystemTime (128 bits hexadecimal) conversion. Added: Now, XL-Tools comes with an installer. Added: Documentation in now online. Restart the tool so the strings in Lang.ini will be used instead of the default language. 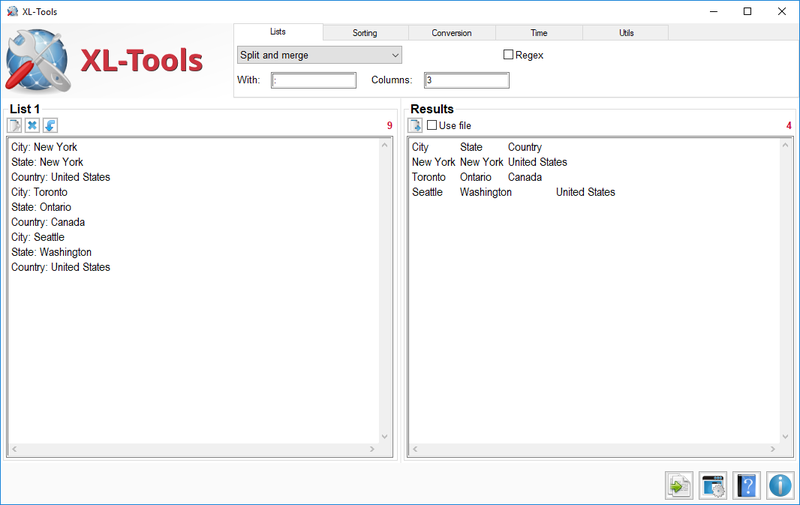 If you translate the tool and you want to share, contact the author. To install, save the appropriate Lang.ini file in the default folder of the tool (if you used the installer, it should be AppData. Otherwise, it's the same folder of the program). No translation available for the moment. The GUI of XL-Tools doesn't support utf8, so if you have some encoding problems, use file for results. This program is free software: you can redistribute it and/or modify	it under the terms of the GNU General Public License as published by the Free Software Foundation, either version 3 of the License, or (at your option) any later version. If you have any problem, suggestion, comment, or you found a bug in the utility, contact the author. 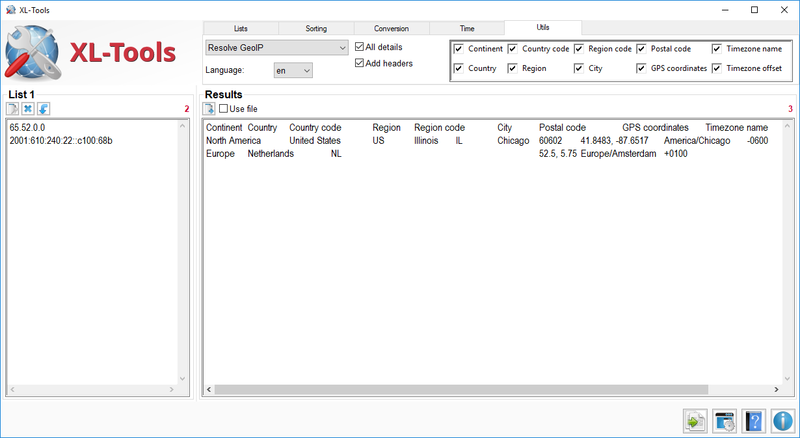 GeoIP Database comes from Maxmind. Link for the database is https://geolite.maxmind.com/download/geoip/database/GeoLite2-City.tar.gz. OUI Database comes from the IEEE Standards Association. Link for the database is http://standards-oui.ieee.org/oui.txt. 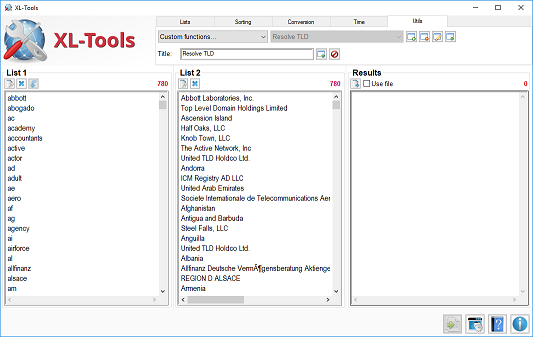 The main logo of XL-Tools has been created by Saki (Alexandre Moore) and is distributed on term of the GNU General Public License. The icon used for Process button comes from Danish Royalty Free Icons by Jonas Rask Design. This icon is distributed as Freeware. Documentation and Cancel (in Utils - Custom Functions) button icons has been created by Oxygen Team on term of the GNU Lesser General Public License. A lot of icons used for buttons come from the Blue Bits collection of Icojam (licensed as "Public Domain") like config, about, open file, delete, check update, import database, etc. Stop icon has been created by emey87 (Manuel Lopez) and is distributed on term of the CC Attribution-No Derivative 4.0 license. Icons for buttons in Utils - Custom Functions and for Datetime database come from Farm Fresh Icons by Fatcow Web Hosting and are distributed on term of the CC Attribution 4.0 license. The check icon used in Configuration Wizard has been created by Cheezen (Anders Bjarnle) and is distributed as freeware. The Copy data from results icon has been created by Yusuke Kamiyamane (http://p.yusukekamiyamane.com) and is licensed under a Creative Commons Attribution 4.0 License. Source code is hosted on SourceForge and GitHub. Binaries are hosted on SourceForge. If you want to download the standalone version or an older version, check on SourceForge. Datetime Database [Updated 2019-03-02] This database is used with sort by date and time function and with all functions in Time. Custom Function - Resolve TLD Custom function that resolves TLD to country name or organisation. Uncompress and use the import function to add. Custom Function - State code to State Custom function that resolves State code to State name (US and Canada only). Uncompress and use the import function to add. Custom Function - Language code ISO-639-1 Custom function that resolves the language code to the language name, based on ISO-639-1. If you install many tools of the XL-Toolkit, you should follow these instructions.